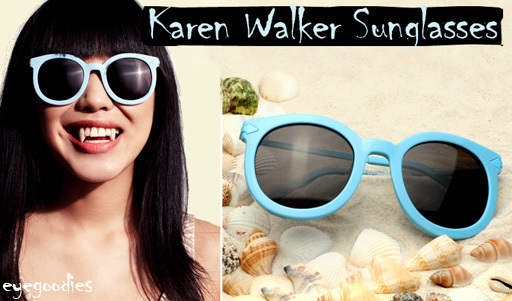 Vampires may be allergic to the sun, but even they can’t resist Karen Walker sunglasses. Karen Walker draws blood this season with an eyewear collection perfectly termed ‘Celebrate the Sun’, featuring frames which have roots in vintage, but are infused with a modern flare. The New Zealand born designer, ever since debuting her run way collection, has enjoyed an ever growing following with collections that are effortless and unpretentious. Karen walker’s designs are quite an eclectic mix, bringing together many elements with a surprising ease. They embody tailored and street, masculine and feminine, dark and bright. In true Karen walker fashion, this season her range of eyewear, all modeled on Vampires in her ad campaign, is quite fresh and lively. 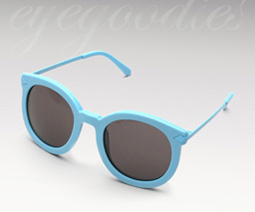 Karen Walker Duper Strength sunglasses are plastic oversized round P3 shaped frames. Vintage inspired circa late 70’s early 80’s, like the sunglasses in Annie Hall that started the craze. Also be sure to check out the Super Duper Strength Its the same shape as the Duper Strength with thicker plastic temples. Ok heres the deal. Demand is high, supply is low, be sure to lock down a pair. The new Retro Super Future fall winter 2009 lineup is set to arrive. The shipment will include restocks of the impossible to find black flat top, and the classic black basic shape. 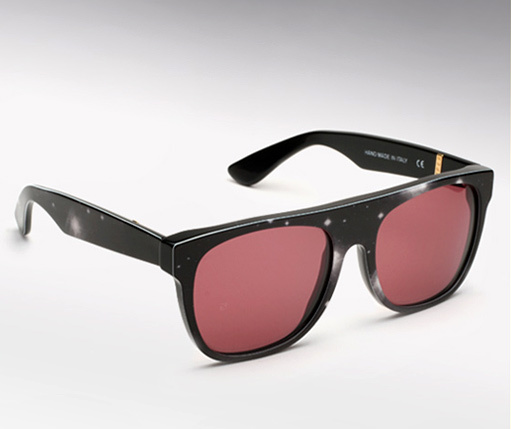 Also take special notice of the francis series (black with gold super sunglasses), and the havana glitters. One more nice color addition is the matte black offered in both the flat top and basic shape. There are some other new joints on the way too, but you will have to wait until they come in to see them here. Please note better pictures will be up when the shipment arrives. We just got a restock of the Super Flat Top Hippy stars sunglasses, you know how hard these are to get your hands on, but we managed to get a few. One of the more limited flat tops and the ones Kanye West is rocking in the Keri Hilson video “Knock You Down”. 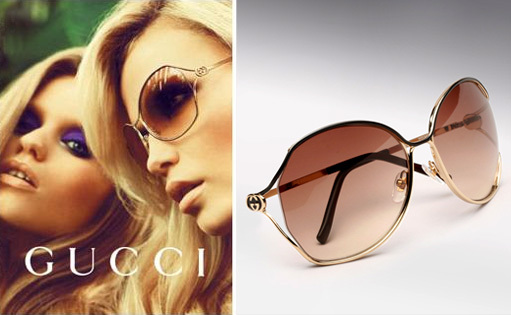 We love The New Gucci 2846/S! This large metal frame with laser cutouts and small interlocking G’s on each temple, is a must have for the summer. 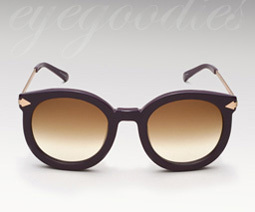 The GG 2846’s chic design is a perfect blend of elegance and style, that says late 70’s-early 80’s luxury all over it. And to top it off they fit most faces really nice. 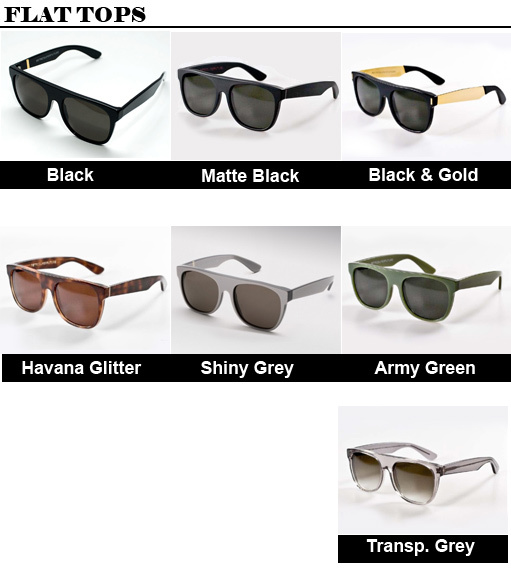 Ray Ban has always enjoyed mainstream success and is arguably the best known eyewear brand globally. For the past couple seasons the frames with the most buzz have been from “Colorizing” (adding colors) to its classic icon models such as the aviator rb3025, the original Wayfarer rb2140 or the Clubmaster rb 3016. However a completely new Aviator this season definitely worth special mention is the Ray Ban RB 4125, also known as the CATS 5000 or Ray Ban Plastic aviator, which is a new release part of the Ray Ban Iconic Collection. 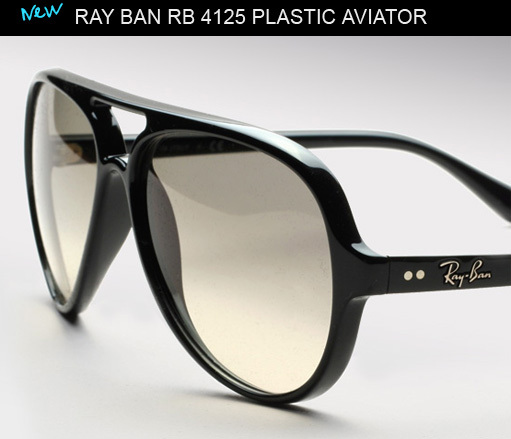 Ray Ban RB 4125 sunglasses are simple clean all plastic aviators. Fitting both men and women exceptionally well, the Ray Ban plastic aviator is one of this season’s hottest shades and one of our must have’s for summer. 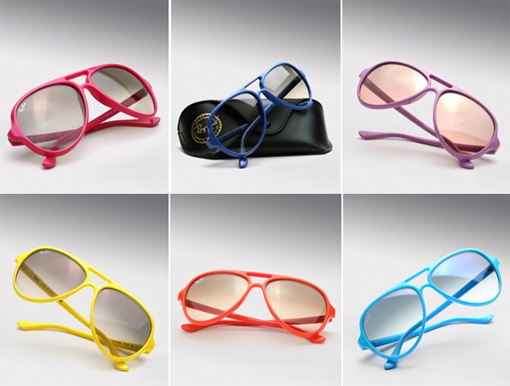 Coming in a color for every mood, from the classic black or tortoise, to the two-toned combos, to a variety of neon shades, you’re sure to find one that suits you. 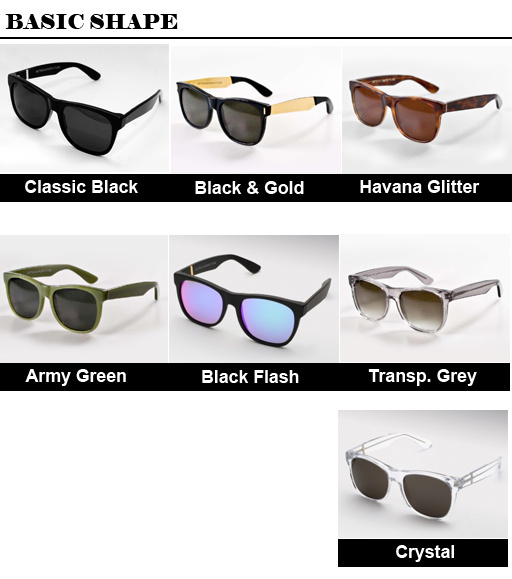 Eyegoodies.com has the whole skittle pack of bright rayban aviators not even regularly released for the US market, so get em while their hot. *European limited releases, In stock now!